Summer high school intern, Tiffany Kintigh writes about her experience while working with the Paper Project Group. Paper? What is paper? It is an object we use every single day, yet we know little about it. All we know is that it is usually white and that we have used it for thousands of years. It is what we use for everyday schoolwork and also for important documents like the Bill of Rights. But we still have not looked at it carefully. Sure, we have witnessed the far reaching explorations of space, and we have traveled to the depths of oceans looking for the Titanic, but have you ever thought about exploring paper? Before I ever started my internship with the Paper Project, I never thought that paper would be interesting. It was just plain, white and boring to me. But now that I am part of the Paper Project, I don't take paper for granted. I have learned to see below that plain surface with the help of a powerful microscope and a laser beam. It took a lot of time for me to master it-just learning which buttons to push and how to use the computer software was a challenge. I got interested in doing a science internship through a friend. Since my parents work at Arizona State University, I asked my mom if she had any ideas. She put me in contact with Charles Kazilek, the Technical Director of the W. M Keck Bioimaging Laboratory and one of the co-developers of The Paper Project that focuses on the world of science and art <http://paperproject.org>. 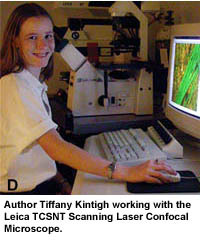 He said that he would be glad to give me an internship, but I had to commit to mastering the confocal microscope and submit an article to a magazine about my experience. The idea of writing and publishing an article was very exciting. The next thing I knew I was sitting in front of the confocal microscope. Turn on the mercury bulb, turn on microscope, turn on air tank, press both buttons on right side, turn a knob, press top buttonso many knobs and buttons! How could I ever remember what to do, and why I am doing it? It just didn't make sense to me. Why push this button, or turn this knob? Everything I had to do was just getting overwhelming. For several days, Chuck patiently went over how to get started, reviewed my notes, and encouraged me. Those first days, I wrote in my journal, "It took a while for me to grasp what most of the buttons and knobs do, but I bet in no time all of this will be like second nature to me." And sure enough, soon I was doing the "driving" (as Chuck put it): getting the microscope set up, scanning the paper samples, getting the samples in focus, creating 3-D images, and burning them onto CD's. I was doing all of that. Here I was, a high school sophomore in a university lab looking deep into the construction of paper, seeing how the fibers wind together like multi-colored snakes. I have never thought anything like that was in the paper we use everyday. All of those colors, and shapes, and curves in a space no larger than the period at the end of this sentence. After a few sessions in the lab, I wrote in my journal: "We did a few samples and all of them turned out fabulous. Chuck was very impressed and I was too. I just can't get over the fact that I mastered the microscope." My best day out of my whole experience was the day I got my project: I was given 4 different types of handmade paper. Each sample was a different color and had small specks of foil in them. My job was to find out if the dyes of the paper made a difference in their appearance under the microscope. We also wanted to know how the foils were attached to the paper. The process required each sample to be scanned using both an Argon and Krypton laser. The colors of the laser lights make a difference on what can be seen in the paper. Dyes used to color the paper can also change the final image. I needed to scan a different area of each sample, save the series, and then process them into 2- and 3-D images. Finally, I had to move the data to another computer where I could archive it on a CD. Sometimes we used Adobe Photoshop to print out the data we got that day. It was very exciting and all the images turned out to be more beautiful than I expected. As I got better at operating the microscope and doing the scanning, Chuck hardly had to help me at all. The focusing didn't take nearly so long as it has been the past few times. What took me about half an hour at the very beginning, now only takes me no more than 5 minutes. All the buttons and knobs were now making sense. The microscopic images were fascinating. Like paintings in a museum. Some of the fibers looked like pieces of spaghetti, weird but wonderful at the same time(A). Others looked like twisted ribbon (C). And the foils they turned out to be held in the paper by all those twisting and turning fibers (B). I never knew paper was so interesting and fun to study and look at! There are so many different shapes and objects in paper that I never thought were possible. The viewer gets to see how the fibers weave together and the color changes when it is seen with laser light. Sure looking at paper for 3 hours straight isn't everybody's idea of a good time, but it has been fascinating to me. This internship has been one of the coolest things I have ever done and has inspired my interest in science. The fibers in the paper I examined are Gampi and also from the mulberry family. Gampi belongs to the daphne family and is expensive to cultivate, because only the bark of the wild bush is available for making paper. The actual name of the tree in the mulberry family that grows in Japan is called a Kozo tree. So you can also hear people refer to the paper made from this type of mulberry tree as Kozo. The area of paper sampled in each of these images is about the size of the period at the end of this sentence. You can contact the author by email.